Current Weight: I currently am weighing in at 134.8 lbs. Which means I am up .8 lbs since last week. 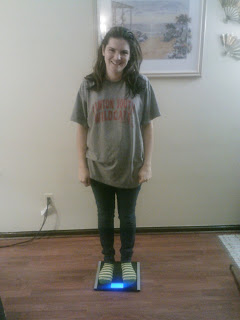 Which means I am down a total of 3 lbs. Activity Performed during the week, accomplishments or failures: This week was a total failure for me I did not exercise at all again but I think that is partly because I didn't feel good. Don't worry about a little gain this week, it's probably just water weight. Just keep doing what you're doing, and you'll see a loss next week!